I started my Dear Francy© Q&A postings while I was caring for my mother “full time”. I found as I faced daily challenges, I would meet other care givers that were experiencing the same issues. Each one of them said something to me; “I feel so alone.” I decided I had to start to share my suggestions to make care giving a little easier for family and friends of seniors. I also wanted a place they could come and check in and send me questions and hear about ideas and tips for care. I have now written two books on care giving. One is a review of general care in the home by family and the other is on the issue of anger. After reviewing the many emails that I have received from my lovely family of care givers….I tried to expand the information into books that will help the families giving care. My new care book is coming out next month…Yeah! 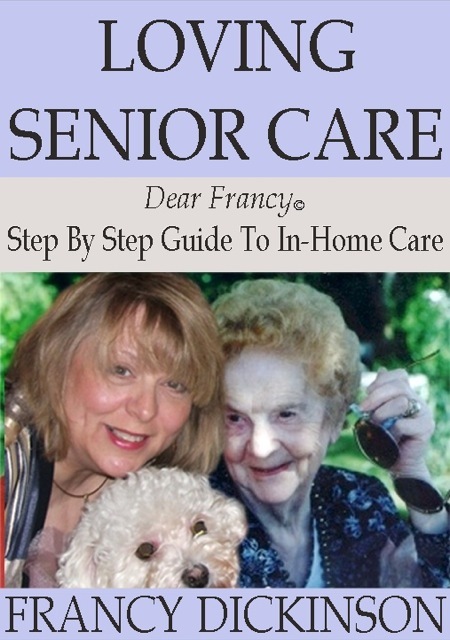 I am also in the beginning of writing a special cookbook for seniors in-care. I am finding that my many posts about preparing food for elders in care are very popular. So, I have started to talk to others that love food and have been care givers in their lives…and I am putting together a nice collection of recipes that will be high nutrition as well as Yummy! My Mother,”Toots”, started to need assistance when she was in her mid 80’s. Even though she still drove her car and was a busy gardener – she still needed to have someone to help her. We started with “hair day” – I would pick her up and take her to her hair appointment and then we would go to lunch or the market. As time went on she drove only close to her home and I did all the rest of her driving to her doctor appointments, shopping or social events. My husband George would change her light bulbs and fix her appliances. Once she was in her 90’s she started having small strokes and we would bring her over to our home to recover and spend weekends. At 95 mother fell and went into the hospital and care center and could not return to her own home. She had very limited funds for her care so she moved in with us and that began the adventure that turned into five years of giving her 24/7 care- all on my own. She passed just a couple month shy of 100 and I am very proud of the care she received through to her life’s end. 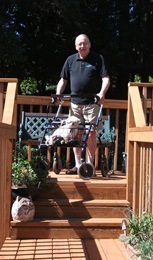 Just as I thought that it was my time again – to be me – I turned around and found my husband had developed dementia and I started the experience the road through the steps of Alzheimer’s. It was so hard to face this after all the years of giving care to mother. I just did not want to do it. But, life does not care what you want – it just puts forth challenges that you have to learn to meet. My husband and I worked our way through Alzheimer’s with our love. He has now passed and I am learning how to live a life on my own as a widow. One experience at a time…I try to share and help you through the tough times in your care giving life and the life you will have after the journey has ended and you are standing alone. I know not everyone can give intensive care, but they can be there for there loved ones, help them through things, make decisions on where good care can be found and be a supportive loving force. Those are the things I hope to share with you on my web site and in this Dear Francy© Q&A blog. Please click on the right and ‘Sign-up’ and you will receive notice when a new blog is out. I would really appreciate your spreading the word about my work. Everyone knows someone that is giving care to a spouse or family member. They are living a life all alone in their home, daily trying to care for someone that is slowly sinking in their health or mind. I want to let them know they are not alone, as well as give them ideas to help them with the daily choices they have to make. A special thank you to all of you that are lovingly gifting your time and attention to care giving. Hope my ideas help. You are an inspiration to all of us Francy. Very nice newsletter too with lots of useful tips. Since we last talked, there have been changes to our family situation too – D has now been diagnosed with Parkinson. So,M will be facing the care-giver role again. Dear Francey. how you have the courage and time to join us all on twitter and regale us with fun and entertainment, is beyond me. I take my hat off. Youre so cool! I dont suppose Ive learn something like this before. So nice to seek out someone with some authentic ideas on this subject. realy thanks for beginning this up. this web site is one thing that is needed on the internet, somebody with a little originality. useful job for bringing one thing new to the web! francy…I admire you so much..you have given me some great ideas as I am entering a similar situation with my mom..this website is great..thanks again. how can I get a copy of your guide book?? It will be out next month on amazon…I will send you a heads up…if you sign up for my blog it will update you each time I do a post. Sorry to hear that your mom is having problems…its a hard road, I took care of toots for five years full time and now georgie has alzheimers…it not a fun ride…ask me anything. Just dont be alone…that is the worst…when you just feel you are caught up in care wo any thank you and you are alone…yuck.